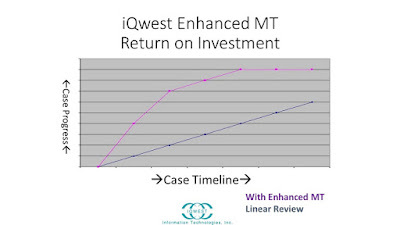 This is a guest post by Pete Afrasiabi, of iQwest Information Technologies that goes into some detail into the strategies employed to effectively MT in a business application area, that is sometimes called eDiscovery, (often litigation related), but in a broader sense could be any application where it is useful to sort through a large amount of multilingual content to find high-value content. In today's world, we are seeing a lot more litigation involving large volumes of multilingual documents, especially in cases that involve patent infringement and product liability. MT serves a very valuable purpose in these scenarios, namely, it enables some degree of information triage. When Apple sues Samsung for patent infringement, it is possible that tens of thousands of documents and emails are made available by Samsung (in Korean) for review by Apple attorneys. It is NOT POSSIBLE to translate them all through traditional means, so MT, or some other volume reduction process must be used to identify the documents that matter. Because these use-cases are often present in litigation, it is generally considered risky to use the public MT engines, and most prefer to work within a more controlled environment. I think this is an application area that the MT vendors could service much more effectively by working with expert users like the guest author more closely. Whether you manage your organization’s eDiscovery needs, are a litigator working with multi-national corporations or are a Compliance officer, you commonly work with multilingual document collections. If you are an executive that needs to know everything about your organization, you would have a triage strategy helping you get the right information ASAP. If the document count is over 50-100k you typically employ native speaking reviewers to perform a linear one by one review of documents or utilize various search mechanisms to help you in this endeavor or both. What you may find is that most documents being reviewed by these expensive reviewers is often irrelevant or requires an expert to review. If the population includes documents from 3 or more languages, then the task becomes even more difficult! There is a better solution. A solution that if used wisely can benefit your organization, save time/money and a huge amount of head ache. I am proposing that in these document populations the first thing you need to do is eliminate non-relevant documents and if they are in a foreign language you need to see an accurate translation of the document. In this article, you will learn in detail how to improve the quality of these translations using machines at a cost of hundreds of times less than human translation and naturally much faster. With the advent of new machine translation technologies comes the challenge of proving its efficacy in various industries. Historically MT has been looked at not only inferior but as something to avoid. Unfortunately, the stigma that comes with this technology is not necessarily far from the truth. Adding to that, the incorrect methods utilized in presenting its capabilities by various vendors has led to its demise in active use across most industries. The general feeling is “if we can human translate them, why should we use an inferior method” and that is true for the most part, except that human translation is very expensive, especially when the subject matter is more than a few hundred documents. So is there really a compromise? Is there a point where we can rely on MT to complement existing human translations? The goal of this article is to look under the hood of these technologies and provide a defensible argument for how MT can be supercharged with human translations. Human being’s innate ability to analyze content provides an opportunity to help and aid some of these machine learning technologies. 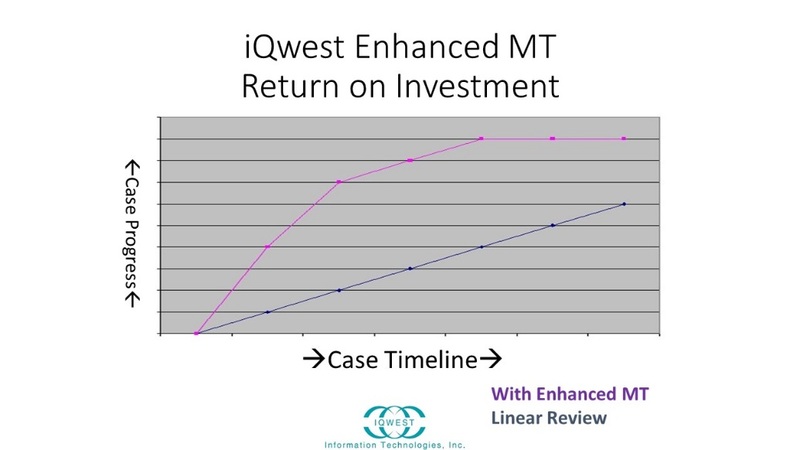 An attempt to transfer that human based analytical information into a training model for these technologies can provide translation results that are dramatically improved. Machine Translation technologies are based on dictionaries, translation memories and some rules-based grammar that differs from one software solution to another. Although there are newer technologies that utilize statistical analysis and mathematical algorithms to construct these rules and have been available for the past several years, unfortunately, individuals that have the core competencies to utilize these technologies are few and far between. On top of that, these software solutions are not by themselves the whole solution and just a part of a larger process that entails understanding language translation and how to utilize various aspects of each language and features of each of the software solutions. I have personally witnessed most if not all the various technologies utilized in MT and about 5 years ago, developed a methodology that has proven itself in real life situations as well. Here is a link to a case study on a regulatory matter that I worked on. If followed correctly, these instructions can turn machine translated documents into documents with minimal post editing requirements and at a cost of hundreds of times less than human translation. They will also look more closely like their human translated counterparts with proper flow of sentence and grammatical accuracy, far beyond the raw machine translated documents. I have referred to this methodology as “Enhanced Machine Translation”, still not a human translation but much improved from where we have been till now. Simply accepting that this base of understanding is common amongst most, if not all languages is important, since the model we will build on makes assumptions that these building blocks will provide a solid foundation for any solution that we propose. Now that we understand what is available, building a model and process that takes advantage of benefits of various technologies, while minimizing the disadvantages of them would be crucial. In order to enhance any and all of these solution’s capabilities, it is important to understand that machines and machine learning by itself cannot be the only mechanism we build our processes on. This is where human translations come into the picture. If there was some way to utilize the natural ability of human translators to analyze content and build out a foundation for our solutions, would we be able to improve on the resulting translations? The answer is a resounding yes! To understand how we would accomplish this, we need to review some of the machine based concept analysis terminologies first. In a nutshell, these definitions and solutions are what we have actually based our solutions on. I have made reference to some of the most important of these definitions below. I have also enhanced these definitions with how as linguists and technologists we will utilize them in building out the “Enhanced Machine Translation” (EMT for short) solutions. Simultaneously human translate the source documents that generated these N-Grams. The human translation stage will build out a number of document pairs with the original content in the original language in one document and the human translated English version in another document. These will be imported into a statistical and analytical model to build the basic algorithms. By incorporating these human-translated documents into the statistical translation engine training, the engine will discover word co-occurrences and their relations to the sentences they appear in as well as discovering variations of terms as they appear in different sentences. They will be further fine-tuned with the results of the N-Gram extraction and translation performed by human translators. 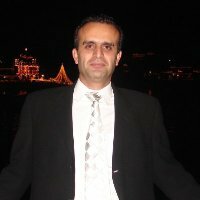 Define and/or extract key names and titles of key individuals. This stage is crucial and usually the simplest information to gather since most if not all parties involved already have references in email addresses, company org charts, etc. that can be gathered easily. In summary, we are building a foundation based on human intellect and analytical abilities to perform the final translations. In using an analogy of a large building, the representative documents and their human translated counterparts (pairs) serve as the concrete foundation and steel beams, the N-Grams serve as the building blocks in between the steel beams and the key names and titles of individuals serve as the fascia of the building. This process has additional benefits as well. Imagine for a moment a document production with over 2 Million of Korean language documents that were produced over a long-time scale and from various locations across the world. 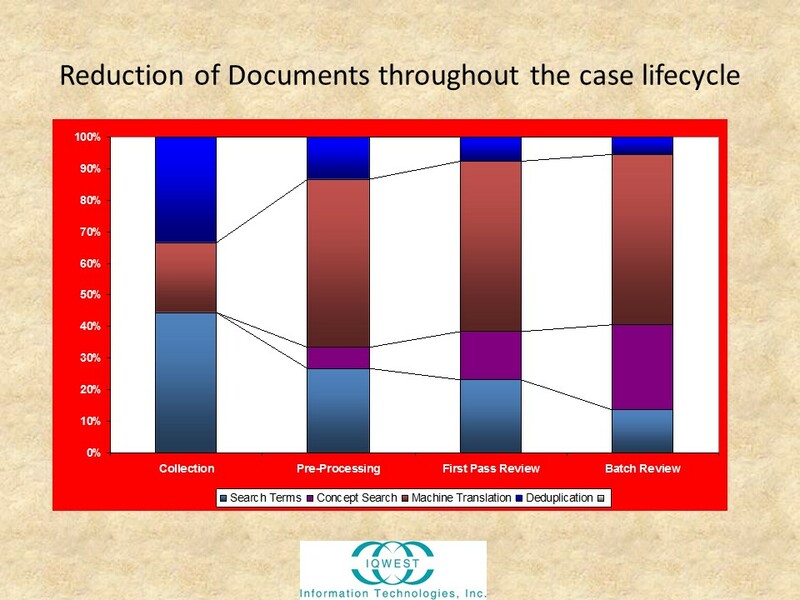 Your organization has a choice of either reviewing every single document and classifying them into various categories utilizing native Korean native reviewers or utilize an Enhanced Machine Translation process to provide a larger contingent of English-speaking reviewers to search and eliminate non-relevant and classify the remainder of the documents. One industry that this solution offers immense benefits is in the Electronic Discovery & Litigation support industry, where majority of attorneys that are experts in various fields are English-speaking attorneys and by utilizing these resources along with elaborate searching mechanisms (Boolean, Stemming, Concept Search, etc.) in English they can quickly reduce the population of documents. On the other hand, if the law firm relied only on native speaking human reviewers, a crew of 10 expert attorney reviewers, each reviewing 50 documents per hour (4000 documents per day on an 8-hour shift) would take them 500 working days to complete the review, with each charging hourly rates that can add up very quickly.